It was the first thing I noticed as news of the Christchurch shooting came in — the patch on the back of the shooter’s rucksack, something that was also emblazoned on the cover of the rambling manifesto. It was far from the first time I’d seen it. I’d seen it on t-shirts sold by far-right fashion brands in France. I’d seen it in photos of shields held by white supremacists at the violent “Unite the Right” rally in Charlottesville in 2017. And, here in Ukraine, I’d seen it on the paraphernalia of the far-right Azov movement. It’s a sonnenrad (sunwheel) or black sun: a symbol commonly used by the far-right, including outright neo-Nazis, originally adapted from a mosaic on the floor on the SS Generals’ Hall. Seeing it in the context of Christchurch reminded me of just how interconnected the global far-right has become. A manifesto was sent to police believed to be sent from the Christchurch shooter. A wade through the swamp that is the manifesto shows a peculiar imagined version of Eastern Europe. And it is clear the shooter matters to some in that region’s far-right. We know the Christchurch shooter spent a lot of time in Europe. But what’s been missed in some coverage of his travels are his specific travels through Eastern Europe, including the Balkans. Police in Croatia have stated that he was in the country between December 2016 and January 2017; some reports suggest that he also spent time in Bosnia and Herzegovina, Montenegro and Serbia. These visits are perhaps reflected in what was scrawled on the weapons allegedly used in the shooting. The weapons bore the names of a number of figures in the history from the region — all of whom who, in some way, had fought against the Ottoman Empire that ruled most of the region for almost five centuries. And the song that was playing as the shooter filmed himself driving to commit the alleged murders is one that glorifies Bosnian Serb war criminal Radovan Karadzic, recently sentenced to life in prison for his genocidal crimes against Bosnian Muslims. “The Balkans have an almost mythical status in the collective imagination of the contemporary far-right movement,” says Jelena Subotic, a professor of political science at Georgia State University. It’s a place where in the far-right’s telling, she says, “white Christians” have fought against Muslims for centuries, whether in the form of battling the Ottoman Empire or trying to exterminate the Bosnian Muslim population in the 1990s. But the way the far-right interprets the histories of Eastern Europe is hardly accurate. “There’s a manipulated and cherry-picked reading of Eastern European history that appeals to white nationalists,” says Tom Junes, a historian and member of the Human and Social Studies Foundation Sofia. The way far-right extremists venerate events like the Serbs’ defeat in Kosovo in 1389 (paving the way for Ottoman rule) and the Polish victory over the Ottomans in Vienna in 1683 are examples of what Dr Junes derides as “a superficial and myopic reading of history”. Authorities have confirmed that the Christchurch shooter spent six days in nearby Bulgaria last year. He appears to have visited a number of historical sites there, including the site of a bloody battle of the Russo-Turkish war in 1878. That battle helped pave the way for an Ottoman defeat and the establishment of an independent Bulgaria. “Shipka pass 1877-78” was reportedly scrawled onto one of the ammunition magazines used by the shooter. But there’s another country mentioned in the manifesto, the one I’m in right now: Ukraine. 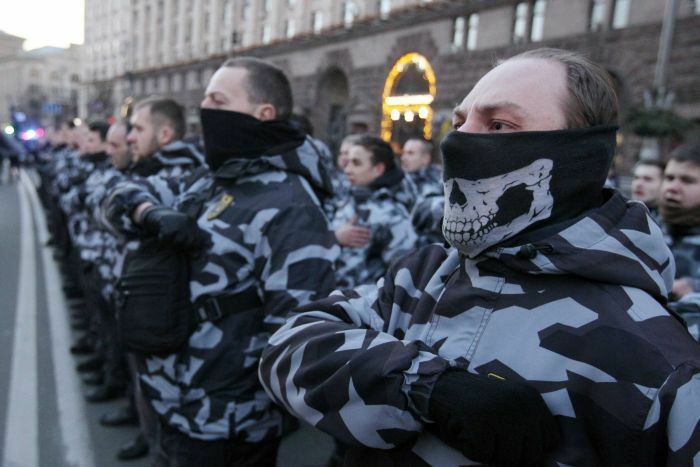 Ukraine is home to a resurgent far-right that uses the same symbolism as the Christchurch shooter, but it hasn’t been mentioned much over the past few weeks. To some extent, this is fair — despite some speculation, we don’t yet know for sure if he was even in Ukraine. Ukraine is home to the Azov movement, a far-right movement originally formed in 2014 as the Azov Battalion to fight Russian-led forces in eastern Ukraine. It quickly earned controversy as a place that accepted open neo-Nazis into its ranks. Five years later it’s become a multi-pronged movement with a political party (National Corps), a street militia and an infrastructure that offers everything from youth camps to mixed martial arts training sessions. In the manifesto, I saw so much of what I’ve become used to seeing from writing about the Azov movement. A need for Europe to undergo a rebirth or renewal — or “Reconquista” in Azov’s terms. Talk about ethno-nationalist homelands and ethno-states. A deep disdain for democracy. References to Valhalla, the place in Norse mythology where warriors go after they die in battle and a common neo-Nazi trope. Talk about a need to march through a country’s institutions, to play a longer-term game and seek positions of power and influence in society. 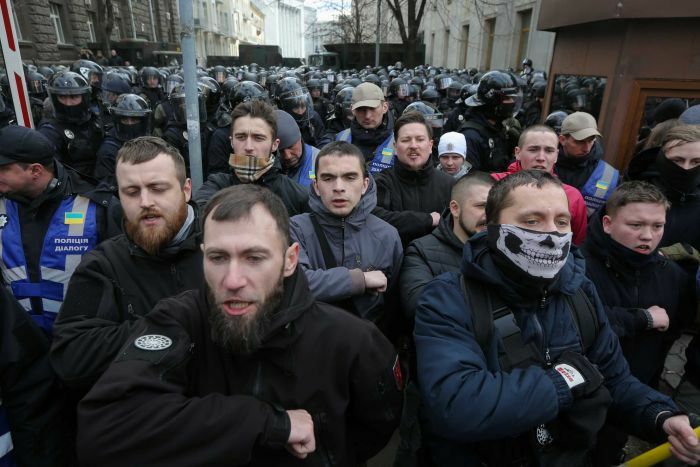 The only thing missing is Muslims — Ukraine’s far-right isn’t as centrally driven by Islamophobia — and the cheap obscurantist polish Azov’s leading lights use to dress up their ideas and downplay the extreme nature of them. And that black sun once again; its dozen of what look like lightning bolts springing out from the middle. 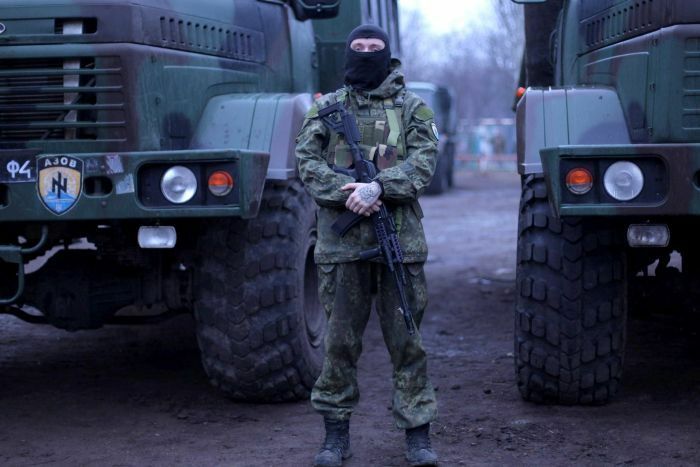 I see it on Azov’s patches, being worn by soldiers, and even used as decoration in one of their social centres. I saw it last night as several hundred Azov movement members, many of them teenagers, marched through the Ukrainian capital; I lost count of how many black sun patches and tattoos I saw. I’ve seen it on stickers on lampposts around Kiev, promoting a group called “WotanJugend” — a neo-Nazi group with roots in Russia but now based in Kiev. “Blood, fatherland, faith,” the stickers say in Russian, with a black sun and the groups’ logo, a Tyr-rune: a symbol graduates from Nazi academies once wore around their arms. WotanJugend has connections with the Azov movement — you can buy WotanJugend shirts, emblazoned with black suns and runic imagery used by the SS, from a small shop inside Azov’s Cossack House in central Kiev. And WotanJugend knows about the Christchurch shooting. On their website, they’ve got the manifesto translated into Russian, and they link to the live-streamed videos of the shooting. They even have a post discussing the shooter, where they describe what he did in Christchurch and praise him openly for it. I won’t quote directly, but suffice to say these Ukraine-based neo-Nazis think the Christchurch tragedy was totally justified — for them, the shooter is a hero. 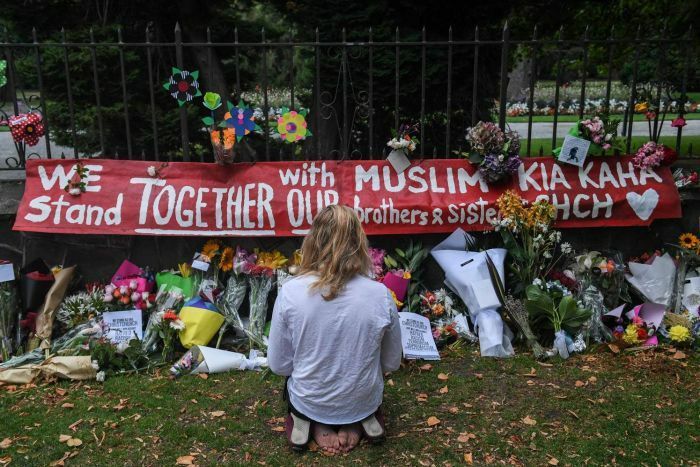 With supporters like these around the world, the Christchurch attacks likely won’t be the last act of far-right terror inspired by a global network of insidious ideas. As acts like those in Christchurch are explicitly endorsed by far-right friends from around the globe, these acts “are thus transformed by lone actors and their supporters into acts of heroic sacrifice,” Cathrine Thorleifsson from the Centre for the Analysis of the Radical Right (CARR) wrote in the wake of the attacks. Michael Colborne is a journalist based in Eastern Europe. He is currently exploring the transnational far-right as a Resonant Voices fellow with the Balkan Investigative Reporting Network (BIRN).